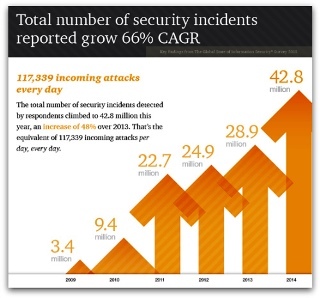 The key observations from the 2015 survey were: The number of security breaches has increased, the scale and cost has nearly doubled. Eleven percent of respondents changed the nature of their business as a result of their worst breach. Not as many organisations increased their spending in information security, and fewer organisations than in previous years expect to spend more in the future. Nearly 9 out of 10 large organisations surveyed now suffer some form of security breach – suggesting that these incidents are now a near certainty. Businesses should ensure they are managing the risk accordingly. Despite the increase in staff awareness training, people are as likely to cause a breach as viruses and other types of malicious software. When looking at drivers for information security expenditure, ‘Protecting customer information’ and ‘Protecting the organisation’s reputation’ account for over half of the responses. The trend in outsourcing certain security functions and the use of ‘Cloud computing and storage’ continue to rise.